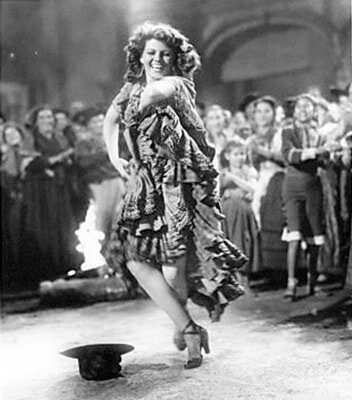 Rita Hayworth is unforgettable as Carmen, a Romani (gypsy) femme fatale - cunning, fiercely independent and completely amoral. Carmen sets her sights on every wealthy man in town, but has a soft spot for the officers, because of their pretty uniforms and regular paychecks. 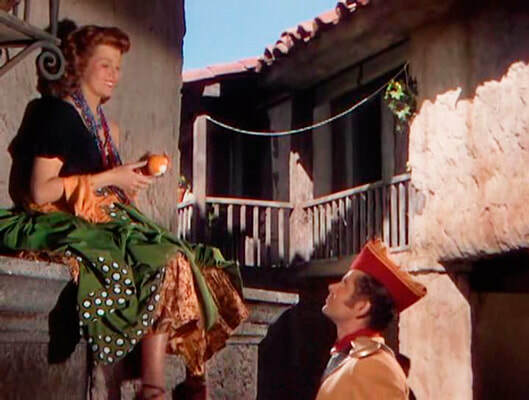 She occasionally works at the factory in Seville, across from the barracks, where she meets the naive and idealistic soldier, Don Jose, played by Glenn Ford. The town residents - especially the women - direct their hatred towards her, because she doesn't fulfill society's expectations of Womanhood. Flirty, with a street-wise demeanor and married to a Romani thief, Carmen specializes in stealing men's hearts, their fortunes and their pride. She decides who she wants to spend her time with, often exclaiming that, "No one tells Carmen's eyes where to go or how to behave, but Carmen". She enjoys speaking her mind and ridiculing the 'betters' of the town, who see her as a liar, a whore and a thief. Fierce and fearless, she quickly turns any crisis to her own advantage in a never-ending game of survival. Don Jose passionately loves Carmen and wants her to commit only to him, which is an impossibility for her. His rigid ethical standards prevent him from enjoying his relationship, and as her interest wanes he descends into a morose state of self-loathing. But in in true femme fatale tradition, Carmen cares only for Carmen. She laughs at the tortured behavior she creates, blowing hot and cold at a moment's notice. The casting of Hayworth and Ford, fresh off their success in Gilda, settles into a white-hot chemistry that feels more genuine and fascinating this time around. Once again, however, Ford’s character attempts to force his lover into submission, mirroring the post-war messaging directed towards women to return home and leave the workplace for men. The film centers on Carmen and Jose's primal struggles and his descent into crime and moral decay. Lilla, the fortune teller, predicts riches and one all-consuming love for Carmen, prophesizing that she can't escape, "It's pulling towards you, with a dark, invisible thread as strong as life-and death-itself". Carmen laughs it off, "We all have to die and I can't think of a nicer way to die than for love." The crew she hangs with are waiting for their leader, Garcia (Victor Jory), who languishes in jail, waiting for his gang to free him. His loyal trio look to Carmen's schemes to help: Pablo constantly worries about money, Remendado is a fatalist and Garcia's second in command, Dancaire, describes himself as someone who has no emotions. Played to perfection by Method actor Luther Adler, he is the gang's nihilist - a voice of dispassionate reason amid the subjective chaos of Carmen and Jose's hyperactive emotions. He sees his objective outlook as armor against the tempestuous trap that his newest recruit now finds himself. 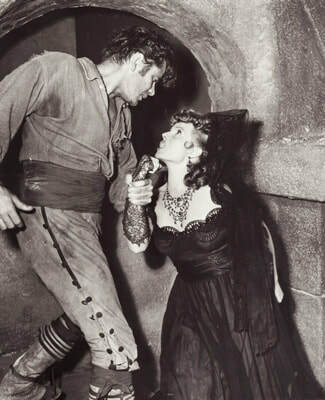 Carmen causes Don Jose’s Colonel to fall on his sword during a fight with him, and in one swift motion of her calculating foot, Jose is branded a murderer and must flee into the mountains with her and the gang. She momentarily pledges herself to him, but everyone - except Jose - knows it can't last. They reluctantly takes him in, teaching Don Jose the art of robbery, smuggling and violence. 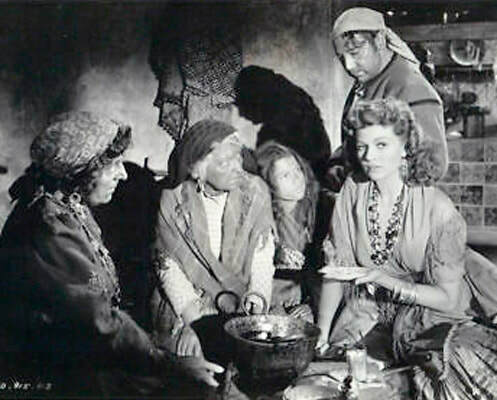 Carmen makes the gang wait around while she romances a bullfighter in the next town. Jose and Garcia, getting on each others nerves, begin to squabble. She returns and goads them into fighting over her and Jose kills him - much to Carmen's pleasure. 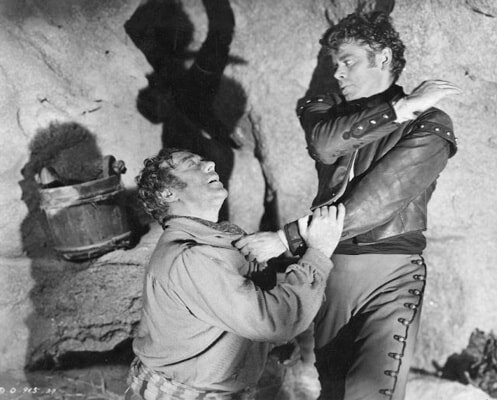 Eventually, it's left up to Dancaire to school Don Jose when his latest criminal action hits a dead-end. "Two murders on your soul now." Jose becomes a bandit and leader of the gang, killing and robbing with an ever-increasing price on his head. He hates her coming into the business, wanting her to stay back at the hideout. "Nobody's my master, I'm Carmen and I work when I want to to work." Dancaire laughs at their constant arguing, pointing out they're a dog and a wolf, and predicts they'll never be happy. 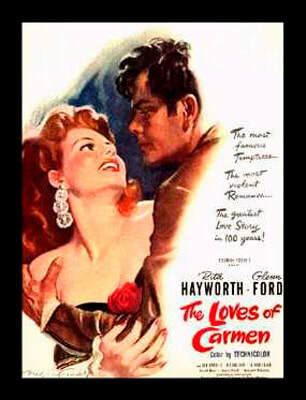 Jose declares his lover has no conscience, but Carmen says he wouldn't love her nearly so much if she did. She again runs into the bullfighter and leaves them waiting for supplies. The crew knows she's found someone else, which drives Don Jose into a frenzy. 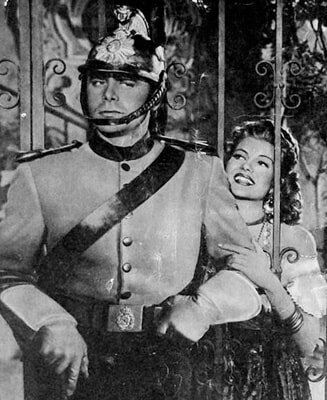 Dancaire points out that Jose is worse than Carmen, because of his over-active conscience. "The only really wicked men I've known were those who started as idealists. That's what depravity feeds on, illusions, idealism and love gone wrong." Jose tracks down Carmen and begs her to come home, but the doomed lovers will never find a satisfactory ending. The Loves of Carmen is based on the 1845 novella by Prosper Merimee, whose work was then revised by Georges Bizet into the famous opera Carmen. Scriptwriter Helen Deutsch stays faithful to Merimee’s original tale, crafting a film noir that hides behind a mask of melodrama, murder and mayhem.